Nature is a versatile and almost inexhaustible source of inspiration; it is both a paragon of robust and raw dynamic power, but at the same time an ideal for fragile, complex and delicate systems of relationships. Over the centuries, nature’s language of form returns as the object of imitatio and aemulatio by many artists. This is also the case for the contemporary artist duo Lonneke Gordijn (1980) and Ralph Nauta (1978) of Studio Drift. Central to Studio Drift’s work is the relationship between nature, humans and technology. Nature’s language of form plays a central role in their oeuvre in various ways. Natural processes and their underlying principles often form an important basis for a work of art, and on other occasions Gordijn and Nauta apply (distilled) forms which they derived from nature. 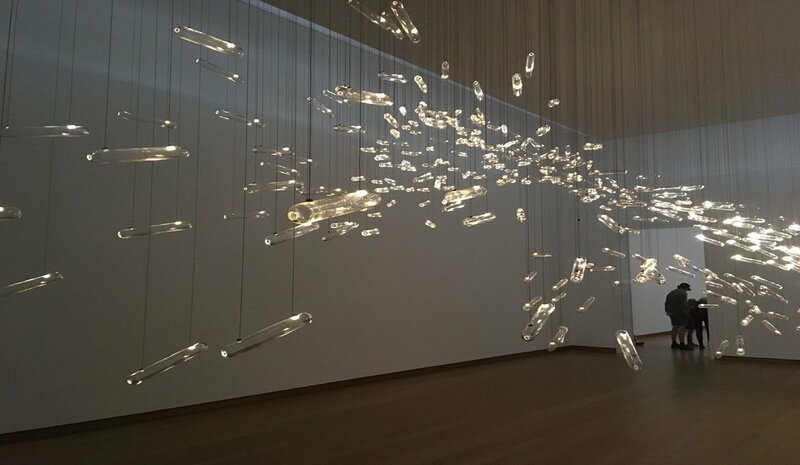 The exhibition Coded Nature (2018) at the Stedelijk Museum of Amsterdam offers an overview of their existing work as well as new artworks that have never been shown before. 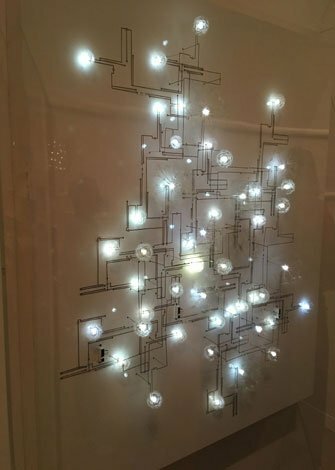 The changing relationship between man, nature and technology is a constant focal point in Studio Drift’s oeuvre. They make natural processes transparent by translating the data they derive from nature the aid of technology and by “animating” objects. Studio Drift does this by using state-of-the-art technology in which they stretch the boundaries of what is possible. To this end, they often collaborate on projects with universities and scientists. Above all, their work offers room for marvel: a reflection about the wonders of nature and how mankind can even make additions through the use of technology. It is through this process that the viewer will find the sublime in Coded Nature. Upon entering this exhibition, the installation Drifter (2017) is probably the most striking work. This work of art consists of a solid but seemingly floating block of concrete, measuring 4x2x2 meters. In many ways, the affective interaction between the visitor and this work is exemplary for the way in which the relationships between man, technology and nature are given shape during this exhibition. On the one hand, nature is intimidating, depicted by a gigantic, solid piece of concrete; it’s solid and immovable form inexorably opposed to the comparatively frail and insignificant form of man. Yet the dominant impression is not one of fear but of wonderment, arising from the unexpected and seemingly contradictory elegance of the massive floating object. It is this experience of the dynamical sublime that plays a major role in the many works in this exhibition. The dynamical sublime in nature equals awe. Anxiety and horror for the inexorable dynamic force of nature, with the possibility of danger yet without any immediate physical threat. 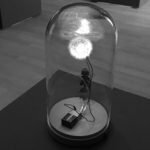 This affective process of perception seems to be used to encourage the visitor to think about the position that humans occupy, both in relation to technology and nature, as is the case with the installation Drifter, but also in relation to abstract concepts such as the collective. In the film Drifters (2016), in collaboration with filmmaker Sil van der Woerd, this latter theme is addressed. In this film, the same solid floating block of concrete takes on near-animistic characteristics. Slowly floating through the air against the backdrop of the spectacular nature of the Scottish Highlands, this block of concrete, according to the artists, embarks on a journey in search of its origin and destination. In this search, the original block is joined by other identical floating blocks of concrete over time. Meanwhile the accompanying music in the background creates a feeling of suspense: although the elegance of the floating concrete blocks is emphasized by an initially calm and stable rhythm, the lower tones swell in volume and prominence over time as more and more pieces of concrete merge themselves into larger collective shapes. All this creates a feeling of tension, fueled by the fear of a seemingly immanent collision between the gigantic blocks of concrete, and all the subsequent natural violence as a consequence. This collision does not occur however, as all the blocks ultimately form a singular, harmoniously floating construction in the landscape, in which each individual block seamlessly fits as part of the whole. The unspoilt Scottish nature, dotted with ruins of human origin, come together in an almost sciencefiction-like image, in which alienation in combination with the dynamical sublime provide a reflection on the position of the individual in relation to the collective. Yet this is not the only form in which the sublime plays a central role in this exhibition. As the work Drifter (2017) shows the intimidating character of nature, it also shows an element of elegance. After all, the sublime in nature does not consists of just the experience of its raw power, but can also be found in the experience of its infinite complexity; the inability to grasp the immeasurable in combination with the simultaneous awareness of this inability. From this experience of the mathematical sublime arises a feeling of admiration. 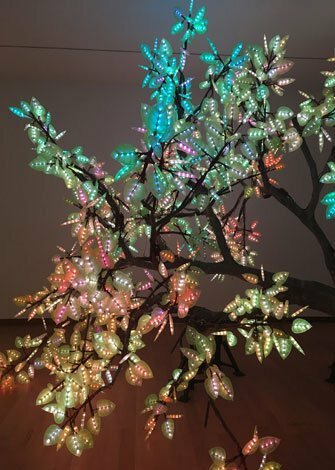 This admiration of the complexity of nature is reflected in many other works from this exhibition, including the installation Fragile Future (2016). 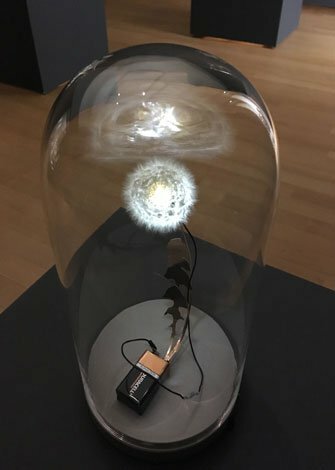 Fragile Future is a light installation of several square meters, consisting of hundreds of authentic fluffy dandelions. After these fluffy balls have been carefully collected and picked apart seed by seed, each fluffy bulb is then reconstructed around a LED lamp as a core. All of these individual parts are eventually combined into a larger working, almost living whole. It is both in the result of this process, a meter-long and high construction consisting of individual parts of only a few square centimeters in size, as well as in the process itself in which each tiny seed requires full attention, that the mathematically sublime comes to the fore. This example of elegance, complexity and aesthetics is both a celebration of the infinite possibility of combinations of relationships and elements in nature, as well as an attempt to add to this complexity through technology. Coded Nature (2018) is therefore a multifaceted exhibition in which the affective perception of both the dynamical and the mathematical sublime plays a key role in the experience of these works of art. This exhibition will be on display at the Stedelijk Museum of Amsterdam until the 26th of August 2018.